If you’ve ever wondered what lurks beneath the expansive glaciers covering Antarctica, wonder no more. The British Antarctic Survey has created a topographic rendering of the continent, outlining every peak and valley that lies beneath the ice. Called Bedmap2, the model offers detailed topographical information about the continent, including a point 2,870 meters below sea level. The topographical map was created using cartographical data, satellite readings, radio echo measurements and seismic data. The British Antarctic Survey team of scientists used each of these variables to map out Antarctica’s terrain in more thorough detail than ever before. In the process they discovered what is possibly the lowest point on Earth’s continental plates, beneath Byrd Glacier in Victoria Land. At 2,870 meters below sea level, the point could be the bottom of an ocean if it weren’t covered with a thick layer of ice. The data collected also revealed that rising sea levels have caused the ice in Antarctica to melt slightly less than previously thought – levels were down 190 feet instead of 200 feet. 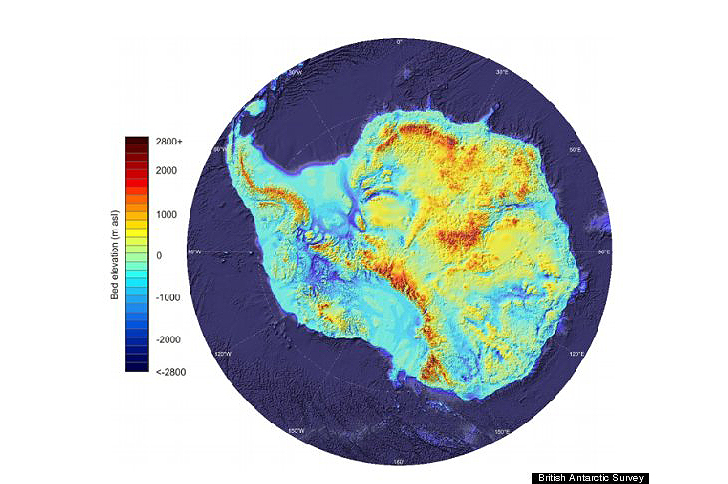 Global warming and the melting of Antarctic ice is still a major concern, and Bedmap2 will allow scientists to monitor it more closely and accurately. Using the new system, scientists will be able to track even slight changes more easily, tracing increases or decreases in the rate of global warming.